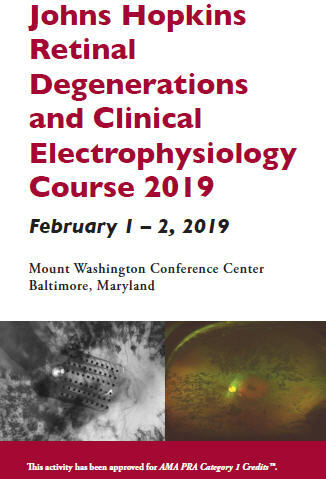 A 1.5-day course to educate ophthalmology residents, fellows, ophthalmologists and retina specialists on the latest developments in the field of retinal degeneration, repair and regeneration, and a refresher course on clinical electrophysiology of vision. This activity is intended for ophthalmologists and retina specialists. A $50 late fee applies to registrations received after 5:00 p.m. ET on January 26, 2019. A handling fee of $50 will be deducted for cancellation. An additional fee may apply for cancellation of other events, including workshops and social activities. Refund requests must be received by fax or mail by January 26, 2019. No refunds will be made thereafter. Transfer of registration to another Johns Hopkins activity in lieu of cancellation is not possible. Review recommendations from the International Society of Clinical Electrophysiology of Vision (ISCEV) regarding visual neurophysiology testing. Review safety and efficacy of retinal stem cell and gene therapy clinical trials. Outline latest developments in the field of retinal degeneration, repair and regeneration.